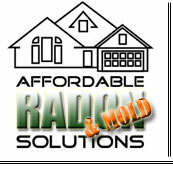 Affordable Radon and Mold Solutions offers comprehensive, value driven, state of the art environmental remediation and mitigation of radon, mold, and other soil born contaminants. We also offer testing, project planning, and consulting services. Our scope of work is always expanding and we encourage you to call us with your needs. We provide services to Homeowners, Realtors, Contractors, Builders, Businesses, Apartment Complexes, Property Management Professionals, Manufacturers, and State, Local, and Federal Government. If you are not on this list, be assured, we want to talk with you to see if we might be of assistance, and how we might earn your trust and business.